I am extremely pleased with my decision to go with the PDM60 after considering serval other options. The installation was a bit challenging on my 2018 Africa Twin Adventure Sports. The positive lead was just long enough to install the unit under the seat, but the ground bus was too short. I was able to make a longer ground bus and that solved the problem. Overall, I am very happy and would highly recommend this unit. This is a neat little box that if I had not used it I would have used 100ft off wire and a bunch relays. This is simpler and prettier and on bikes with no room a must have. Only had it for 3 weeks so I can’t speak about durability. It is a bit pricey though. But you get what you pay for! It doesn't get any easier to install a PDM than this! It comes with almost everything needed to install it including crimp rings and power connectors. I added a (6) terminal block bought separately for grounds and used the leads from the devices I wanted to power with this PDM. I run a GPS that is powered all the time when the ignition is on, charge my phone, and charge a HAM radio HT and I still have 3 circuits unused for future expansion. fuse less is the option, much easier to install anything, and for custom application it is good. Thank you.. I'm still working on installing my PDM60 onto my R1200GS. I'm not an electrical tech, so my comments may not be well-informed. 1. The package is tidy, small, and attractive. I plan to install it on the outside of the bike between frame members just below the seat on the right side. Being weather-proof is important to me and it mostly is. 2. The programming port is on the back of the module. That will make re-programming after initial installation a bit of a pain. Additionally, I'm less than certain about the weather-proofness of the programming port. 5. For this need, I'd buy it again. Setting the exact amp rating for each device. Color marked cable made it easy to identify circuits. Smaller than standard terminal based distribution blocks. USB cable is product specific. Could be easily misplaced (who doesn't have a pile of USB cables laying around). Provided directions were OK but I ended up going on the website for a better understanding of the install and programming. Put this on my BMW GS. got tired of having all the accessories going to fuses and not being able to control when they were on. this unit allows it's circuit breakers to completely eliminate fuses (no need to carry spares anymore). it also allows you to program which items are only on when the ignition is on (no more drained battery). takes a bit to install (pay attention) and is a bit pricey, but well worth it. also plan out your circuits and write them down, you'll be glad you did. Power management and distribution can be tricky in any vehicle. But on a bike it is killer important. I have a USB plug, heated grips, and LED running lights. I plan to add a heated jacket in the future. Managing these accessories on a naked sport bike frame (SV650) takes some finesse. As well as occassionally killing the battery when my old man brain leaves the hand-grips on. But the PDM-60 solves all of these problems with the added functionality of keeping my LED running lights on for 120 seconds after I turn off the ignition so I can see to put my bike to bed for the night. If you know basic bike electronics, the install was easy, the configuration was easy, and testing was easy. Not a hard project. Very well built unit and a great addition to my rig. A good way to power up accessories. I have a 2012 Concours and needed to install a few additional power outlets and lights and this unit had the features I needed. Power install was easy enough and you use a computer to change some settings on this unit. I have not had any issues with this unit and would buy another if I need it on my other bike. Finally a way to use 12 volt accessories with a CANBUS bike ! This is what BMW should add to all the bikes with the CANBUS system. You can program it to your likes. It is like having a mini computer controller on board. Beard level 1 in ease if you know 12 V systems. A beard level 2 for someone new to wiring of accessories. Price is within its quality and features. Could not be happier. Thanks RevZilla ! I like the idea of breakers instead of fuses. I can program different setting for each breaker easily. I chose this because I have to many extras connected directly to the battery(Aux lights, PCV, Gerbings). I want to clean up the wiring and have the ability to select always on or on when powered. Installed two of them on each of my BMWs. Work great! I chose this power distribution module because I plan to do some long distance travelling / camping on my motorcycle. I will be taking some extra electronics with me such as phone, camera, gopro, laptop, etc. and I need to have some way of charging all of these. I plan to use this item, along with some creative wiring to do this. Best solution out there. No fuses. Customizable amps per output. Fully waterproof. Never have to take off your fairing or seat to change a fuse ever again! Needed fuse block for BMW can bus electrical system. Ease of use and instalation. 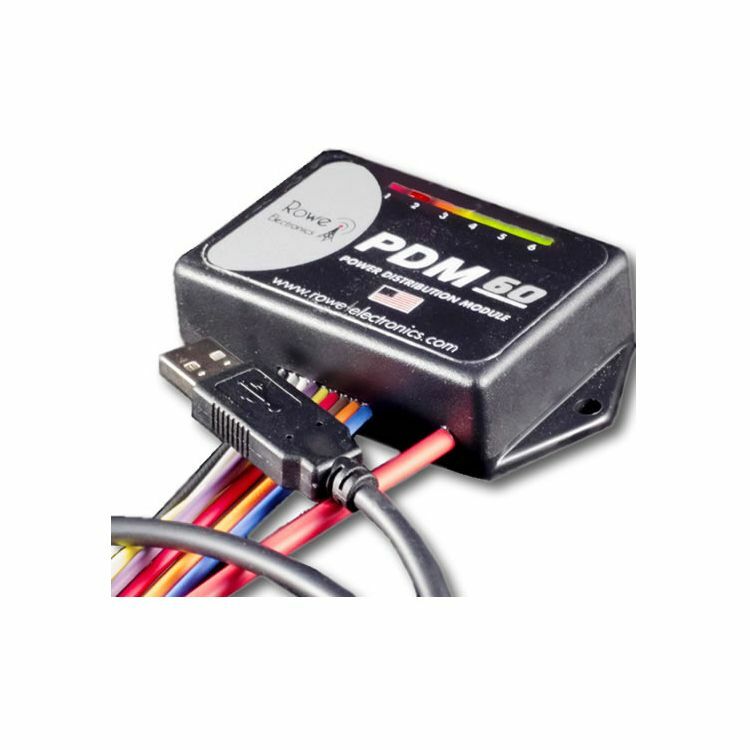 The PDM60 appears to be the best value for money device for adding electrical items to a CanBus vehicle. Makes it easy to add accessories without digging all the way down to the battery every time. No need to carry a bunch of spare fuses for everything connected. Read some reviews and this module seemed like a good idea to protect all of my electronic farkles. An impulse buy. But I've read the reviews, and I need this! Need to power a GPS and some other accessories. Recommended highly on K1600 forum. Great features. I want to add additional lighting and other power related items on my 2012 Concours. I hope this will be a better way of wiring items into the system. Excellent reviews, programmable, no fuses, waterproof, small, common ground. I'm accumulating accessory items for a '14 BMW R1200 GSA that will be here sometime in the Spring. The Rowe module appears to be a very simple installation without having to add the wiring for a separate relay. Everything is built in and I appreciate the simplicity. It was exactly the item I wanted for adding cameras, etc. to my bike. It got good reviews. This thing is great if you plan on adding electrical accessories. Simplifies the connection of add-ons once installed. fuse less, and practical for accessories and installations. I was looking for a fuse box that will handle my accessories on my Triumph Tiger 800 as there isn't much room between the battery and the seat on the Tiger so I don't want lots of wires going direct to the battery. This will do all of that and allow me to adjust how the accessories turn on and off. tidy up cabling on my bike. Needed additional power block for heated gear......this module is exceptionally useful and does the job well! Great product. I have one in my other bike. Running 2 GPS's, heated grips, driving lights and possibly a heated vest I wanted a clean electrical installation. The PDM60 has a good reputation and was reasonably priced. I need to fit accessories to my new BMW S1000r (GPS, Radar Detector, USB charger and power my Camera). Wanted the versatility it provided And to future proof any more accessory decisions, it works perfectly, if you have the cash and are thinking of this item you won't be disappointed. Super easy installation. No fuses, compact, programmable, set delays etc. Love it. After adding a few "Farkels" to my GSA and crowding the battery box with aux power sources, I decided to clean up the mess. The PDM60 is water proof and programmable.. I buy one of these for every new bike I own. This is my third time putting one on a new bike. As an electrical engineer, I love the programability and rugged design. The PDM60 has never let me down. In 2013 my wife and I rode half way around the world on bikes equipped with the PDM60. One of the best, if not THE best power module out there! The best part about this is that it's absolutely dead easy to use. HIGLY recommended! Absolute simplicity. This is such a no-brainer, I'm tempted to replace my stock fuse block with this as well! Chose this after online recommendations and if there is a wiring fault you don't have to keep changing fuses until the fault is found. Setting up my new Triumph Trophy with extra power toys and want to run all 'outside' the power system of the bike... great way to have a second electrical bus on the bike isolating the bike electric functions form extras. Was what I was looking for in a fuse block. Will be adding some electrical farkles to my beamer bike and this product comes highly recommended on my online forum, is CAN-Bus compatible and can handle significant loads. Does the PDM60 come with the USB cable to program it via a windows compatible computer or do I have to order that extra? BEST ANSWER: It does come with the necessary cable. The connection to the unit is unique to this product. How is the USB connection waterproofed on the unit? That is, I know the PDM60 is waterproof ... what about the USB connection? BEST ANSWER: They use dielectric grease where the prongs go into the unit. You will need to reapply after use. This is a great unit and easy to use. There is the normal USB plug on the one end of the cable that plugs into the notebook, the other end of the cable has 6 exposed spikes that plug into the back of the PDM60. The instructions state to orient the spikes a certain way before you can program the PDM60. The back of the PDM where the spike end plugs into does not have a protective cap but the instructions state the PDM is waterproof. Insert the spike ends into the connector on the back of the PDM. Even though I installed this unit a few months ago, I just programed it today to change how long it takes to activate the circuit. I put driving lights on the front forks and when I would go from high beam to low, the driving light circuit would take 7 seconds (pre-programmed on the PDM60) to bring the driving lights back on. I was able to program it to activate the circuit in 3 seconds. I have also used the PDM to add 2 new 15 amp powerlet sockets. Using the PDM has made it easier to wire up all the circuits without having a CANBUS issue or a rats nest of wires. I would buy this item again if needed. Hi I have just bought PDM60 Power Distribution Module, Yesterday I schould mount it. And did not understand why it is two Thin groundcables. ? Shall I mount both of them to the frame/batt- And the short black one with a cap on.. ? where ?? BEST ANSWER: 1. I mount mine under the seat close to the battery but were ever you can find room to mount it is fine its water proof. 2. You should have gotten a short black wire with two female ends on it that is to be hooked on the ground side of the battery (-). all the returning grounds coming from accessories hook to it and there a black rubber boot that is used to insulate the exposed wire. 3. The thin Black wire is used for an off/on switch. (toggle switch. other wise it doesn't have to be hooked. 4. The Gray wire marked trigger wire: I suggest hooking it to the positive wire going to your tail light or any other that powers up when the ignition is turned on . This will power up the PMD60 when you turn on the ignition. It comes programed to delay powering PDM60 for 7 seconds after the ignition is turned on. 5. The large RED wire goes to the Positive side of the battery. 6. You have 6 circuits coming off the PDM60 and each wire will be considered the Positive wire. The returning Negative (-) Black wire goes to the short Black wire that you hooked to the - side of the battery. Hope this helps if you have anymore questions just me another text. The blue is a ground for the trigger. The black is the main ground for the PDM. What you should do is take the thick black cable and up it to the negative on the battery. This will be your ground buss and then add the black and blue cable to it and all other grounds. Make sure you make all the other curicuits inactive before tucking them away. Any other questions let me know. Is there any provision for battery charging through the unit or do you have to hook up directly to the battery? BEST ANSWER: No. There is no provision within the unit for battery charging. I still use a separate connection for battery charging. Absolutely NO charging through the unit! hi. WHAT IS THE SIZE OF THE UNIT? What are the dimentions of the unit? BEST ANSWER: 2"x3"x.8" It's a very small unit. The unit is 3 1/4" L X 2" W X 1"
BEST ANSWER: I haven't installed the unit yet (still working on a professional looking bracket), but just looking at the USB connection to the actual unit it appears to be waterproof. I would have to take the manufacturers word on it. The USB cable is the normal USB2 'A' connector on the PC end, and what looks like a proprietary male 6-pin 1/10inch spacing inline pin plug connector on the other end. The corresponding 6-pin inline jack on the back of the PDM60 appears to be packed with dielectric grease. That looks sufficient to keep out any moisture that might collect on the back side. If you mount the PDM60 flush to some surface I would say it would resist water short of submersion or a prolonged power wash. The wires exiting the unit look well sealed, too. The USB connection has Dielectric grease in it. Make sure it still does when you remove the USB Cable. If not add some more to it. Unit is great. Disconnect positive from battery to program. It will not program otherwise. Great tech support. Will this work on my 2007 kawasaki vulcan 1500 classic? BEST ANSWER: Yes, as long as you can get with in about 18" of your battery and hide it somewhere. There are usually lots of things to tie wrap it to or hide it behind. I have a 2012 Yamaha Super Tenere and I put mine behind the RH side cover. The cover is easy to remove to check it for faults if I need to, which I haven't so far. Low voltage cutoff if leave an accessory on? BEST ANSWER: With regard to the PDM60, call Rowe and ask. They are great people - very helpful. Do ask if a load connected to it will draw minimal current when the PDM60 has shut off the load. I have an Apple PowerBook, but no Windows computer. Can I still configure the PDM? Did you check there web site? Thanks for the suggestion to go to the Rowe website Marc. I did that and learned that there is a beta program for configuring the PDM60 called "Universal Dashboard" that will run on Windows or Mac. I hope it works out. It's a fantastic product. How will the PDM60 interact with my Battery Tender/emergency jump leads if they are both attached directly to the battery at the same time? BEST ANSWER: it wont affect it at all.